Tabbed index dividers organize your binder instantly. 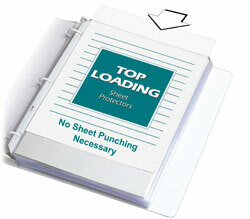 Sheet Protector Special Features: Write-on tabs make it easy to customize each divider in order to better organize any standard three-ring binder. Suggested Use: Organize your binder without taking up additional space with oversized index dividers.